Water moves through the Lakes Basin as an ever-present undercurrent to the land surrounding the Sierra Buttes. 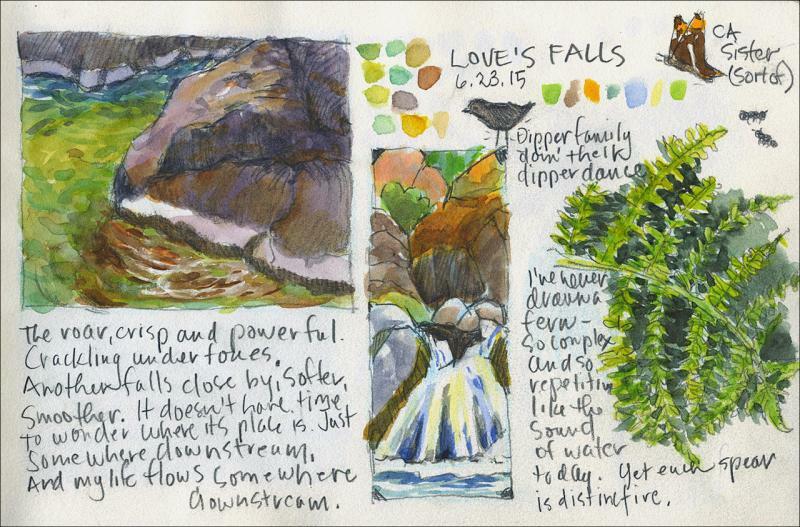 In this workshop, we will explore techniques for capturing the dynamic energy of water, along with rocks and wildflowers in our journals. We will spend the first morning learning to use our compact kits mixing a full range of colors from a limited palette of pigments. Each day we will take a 1-3 mile hike to different locations including waterfalls, lakes and streams. The evening before we will work with small photos to gain comfort with sketching and painting the setting of the following day, and each morning I will give demonstrations on-site before we get started. There will also be an emphasis on page layout and adding notes and prose to your pages. $55 kit fee required. Poetry included. Please plan to arrive at the Sierra Nevada Field Campus on Sunday afternoon by 5 p.m. when we'll meet informally on the dining hall deck to get acquainted. Class will formally begin at 9 a.m. on Monday morning. Demonstrations on how to render water scenes characteristic of each day's destination will take place both on campus and in the field. 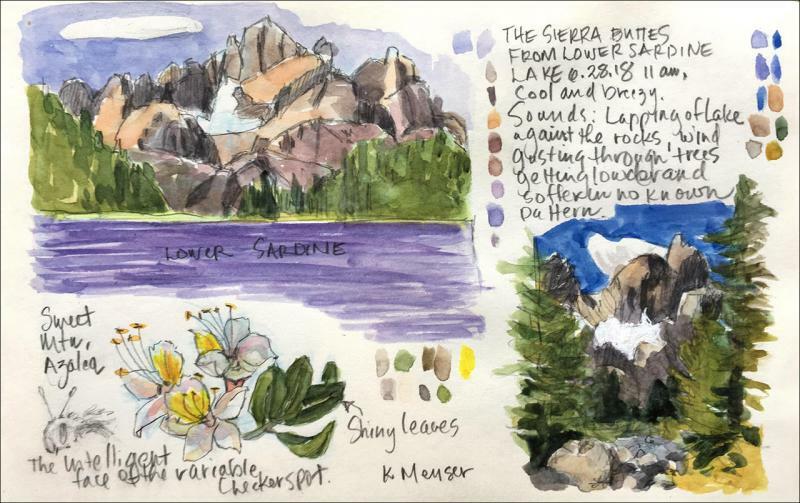 A light and portable field journaling kit is key to keeping a nature journaling practice alive. The kit is REQUIRED (if you have taken my workshops before and have a kit, please bring it) and includes a simple palette with eight pigments that you’ll learn to mix into a full range of harmonious colors. You’ll also be provided a journal, a waterbrush, and other tools. The kit is available when you arrive at my cost of $55. 3. Lightweight 3-legged stool (available at REI for about $22) – this type of stool creates less of a foot print and is lightweight and portable. You may also want to bring a small foam pad. Although days are generally warm, or even hot at lower elevations, be prepared for temperatures as low as freezing at night and the possibility of rain. Variable weather clothing that may be layered is best. Bring long pants and a long-sleeved shirt, warm sweater and jacket, t-shirt and shorts or skirt, tennis shoes or hiking boots, rain gear, and a warm hat and gloves for cold weather or night activities. And don't forget your swim suit for warm afternoon dips in the lakes.